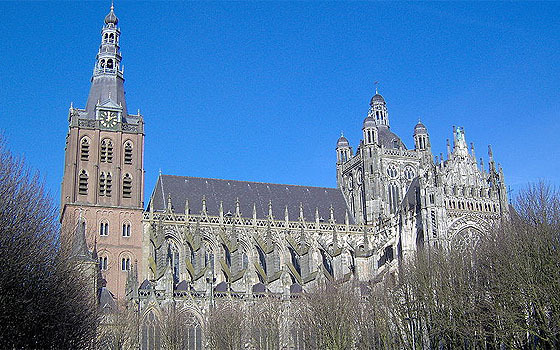 The Roman Catholic St. John's Cathedral is located in the center of the city of ‘s Hertogenbosch (abbreviated: Den Bosch) in the south of the Netherlands. 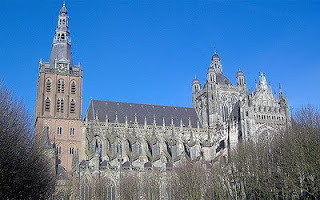 The medieval cathedral is richly decorated by dozens of small and large statues on the roof and the buttresses. In the 19th century the cathedral had fallen in a state of decay. Luckily money was found and several restorations were carried out, the most recent one started in 1998. During this last restoration missing statues have been replaced by newly made figures. Therefore Amersfortian Ton Mooy sculpted 25 new angels in his atelier in Amersfoort. Interestingly enough he also decided to create one modern angel. 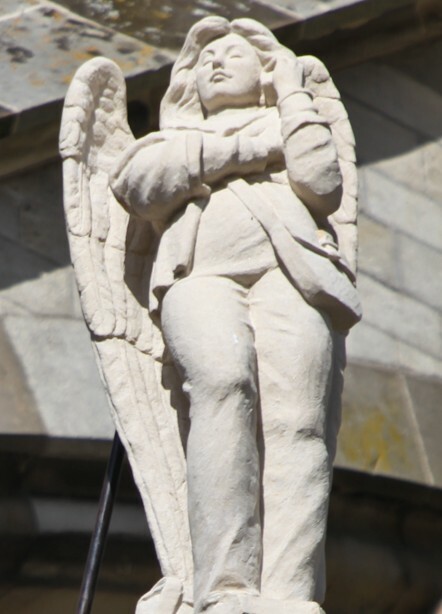 Although the cathedral's fathers rejected an angel with jet engines on the angel's back, they finally approved of an angel in jeans with a mobile phone. 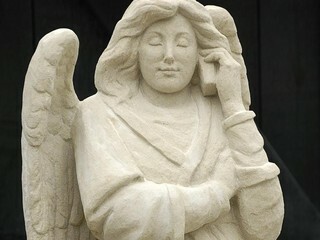 4-2012 update: here's an NYT article about the angel, who receives a lot of phone calls! Interesting. Were the statues always missing or were they damaged or destroyed at some point along the way? They were damaged and destroyed; a.o. in the summer of 1566 during the so-called beeldenstorm ('Iconoclastic Fury'), when religious fanatics vandalized nearly all Dutch churches with devastating effects. Absolutely beautiful!! Stunning and very unique as today's world is distracted by modern technology, this is a nice way to bring past to present. I'm glad you like it. Some people seem to be offended by the modern angel. I really enjoyed seeing this modern angel statue. She's lovely!